September 2017: The use of social media by German cities has become increasingly popular during the past ten years. The cities’ town halls, their marketing and tourism offices use Facebook, Twitter and other platforms to inform residents, promote tourism and investment as well as provide visitors with details of cultural and sporting events. Hamburg and Dresden were one of the first major German cities to open Twitter accounts in 2007. By 2009, cities like Munich, Bremen, Nürnberg and Münster had all signed up to the 140-character social media service. However, during the past five years, Facebook has replaced Twitter as the most popular social media platform among towns and cities in Germany. 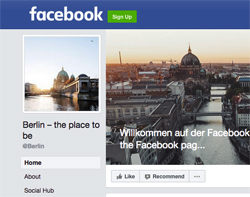 Berlin’s principal Facebook page, with more than 1.5 million followers, is the most popular social media account run by a German city. Hamburg and Cologne rank second and third, with 726,000 and 551,000 followers respectively. 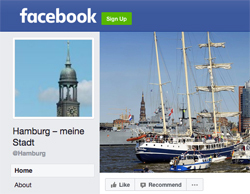 Hamburg has the most popular Twitter page, with some 215,000 ‘friends’, followed by Munich and Frankfurt. 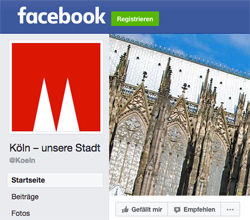 Per capita, Cologne has more Facebook followers than any other German city. 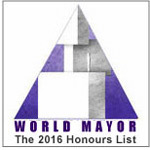 Berlin and Hamburg rank second and third. Cologne’s number of Facebook followers amounts to more than 50 per cent of its population  although, of course, not all social media followers are residents. Invariably, popular tourist destinations like Berlin, Hamburg or Munich attract a considerable number of followers from across Germany and indeed the world. Cities with ratios above 20 per cent include, in addition to Cologne, Berlin and Hamburg as well as Munich, Frankfurt and Dresden but also smaller cities like Ulm, Karlsruhe and Mainz. Most cities use their social media pages to supply municipal announcements, list events and market tourist attractions as well as business opportunities. In August / September 2017, Berlin promoted the city’s Banksy exhibition, the blind football European championship and an international beer festival. 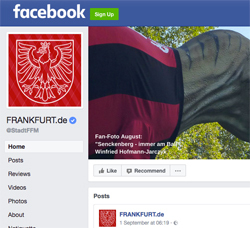 Frankfurt’s Facebook page provided extensive information for the 70,000 people who were forced to leave their homes while a WWII bomb was being defused on 3 September 2017. Hamburg’s summer festivals included a medieval jousting contest and a plastic duck race on the Alster, the city-centre lake.